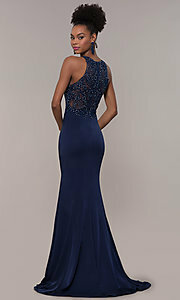 Here's a long formal dress with a high-neck embroidered bodice. The mesh bodice is beautifully adorned with intricate rhinestone-accented embroidery for an elegant bit of sparkle. A crop-top-style jersey lining offers coverage and creates the illusion of a mock two-piece dress. The floor-length satin skirt on the long evening dress cradles the curves and provides a figure-flattering fit. Flaring out in dramatic fashion below the knees, the trumpet-style skirt balances the look of this long formal dress. Leaving a lasting impression as you make your exit, a gorgeous trail-behind train completes the stunning style of this long formal dress with embroidered-bodice.